The Orientation Programme for Newly Inducted Faculties came to an end today. The programme commenced with the Pro-VC of KIIT DU Prof. Ramababu Kodali’s deliberation on the topic “Connecting to Aspiration and Capabilities”. He advised the news faculties to implement the polices and the programmes of the University in letter and spirit apart from connecting themselves with the students to propel the university to the next level. 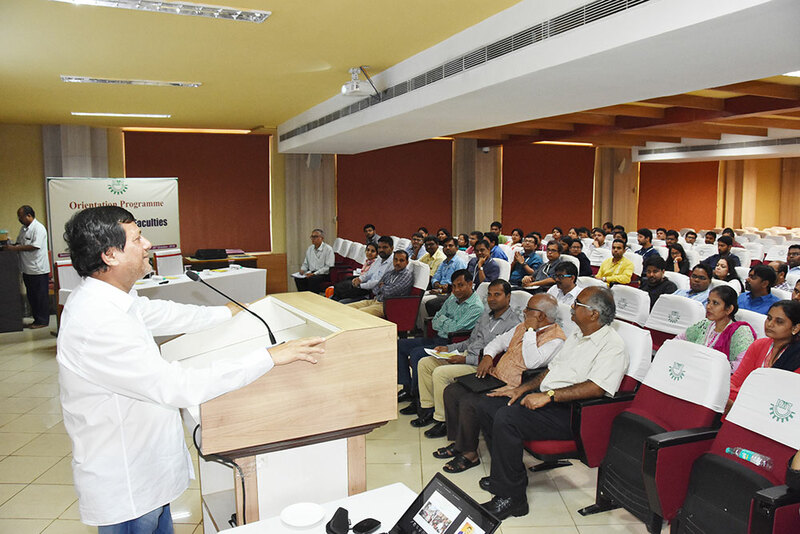 Gracing the event, Prof. Achyuta Samanta, Founder of KIIT and KISS gave his blessings to the faculties for their career growth as well as fulfillment of their goals and targets. Prof. Samanta remarked that the KIIT Deemed University is a unique one in the global map of academic institutions. The faculties should feel proud to be part of it and contribute to the vision of taking it ahead. He urged the faculties to be Social Media savvy for the betterment of the organization. The Founder advised the faculties to adopt dynamism and 360 degree approach in pedagogy. Prof. Hrushikesha Mohanty, VC of KIIT-DU also addressed the faculties by drawing upon our ancient Indian culture to the modern day practice of referring to Google Guru in each and every matter. The faculties may lose their relevance unless they adopt innovation in teaching practices. He also deliberated upon the future of learning. Mr. Sibananda Mishra, Director, HR apprised the faculties about the rules and regulations of the HR of KIIT DU and assure them the support of the HR Cell in all endeavors. He held a question answer session to clarify the doubt of the faculties. Towards the end, the Pro-VC discussed about the best practices to be adopted in teaching and learning. The programme concluded with Vote of Thanks to all the speakers and participants by Mr. Chinmay Kumar Das, Director of Administration.